Ryan Bemis, DOM, is an acupuncturist and healthcare provider at the Crossroads Community Supported Healthcare center based in Las Cruces, New Mexico. He, along with other Crossroads teachers, have trained dozens of community health promoters in the border region. In the following Q&A with Molly Molloy of the Frontera List, Bemis shares how acupuncture plays a role in the healing of an underserved border community racked with violence, emotional trauma and poverty. 1. How did you first get involved with acupuncture and what made you want to work in underserved/border town communities? The protocol — known as NADA (National Acupuncture Detoxification Association) – is safe and simple, and easily taught to community workers, and has been implemented in a variety of grassroots mental health and humanitarian aid contexts for the past 4 decades. I saw what an effective non-verbal intervention it proved to be, especially for people who struggled with talk-therapy or 12-step groups or pharmaceutical care. And the fact that it can be taught to health promoters and front-line providers makes the service delivery extremely cost-effective. I went on to go to acupuncture school where I had the chance to write for a periodical that focused on researching the use of this protocol. 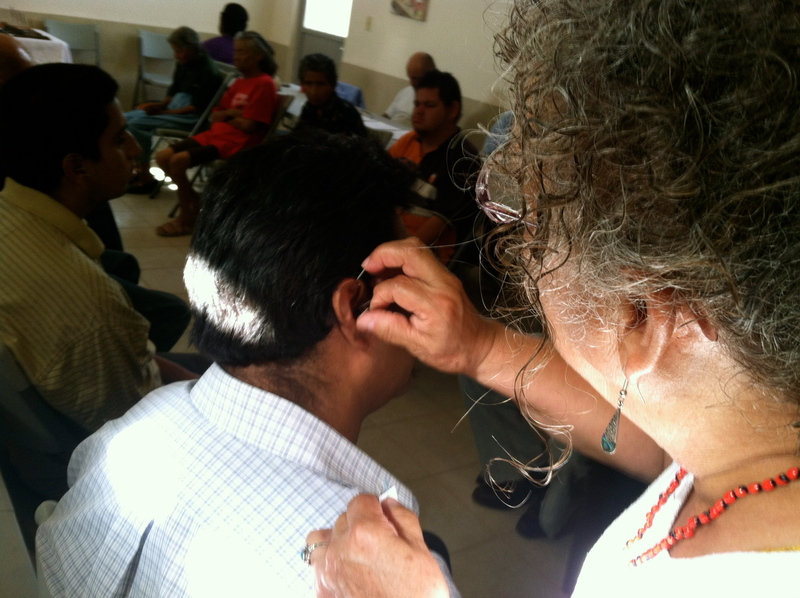 One report I did was on a family clinic in Anthony, NM that was — in 2008 — providing ear acupuncture for refugees from Juarez fleeing violence. I returned in 2010 and visited a few different projects within churches in Juarez serving women and marginalized groups in the city, to learn more about the challenges in providing community care. I was invited to do a community acupuncture session for some laid-off maquiladora workers. They were gathering regularly in a small church on the north side of Juarez to do breathing and relaxation and stretching exercises similar to tai chi and yoga. They liked the treatment, and asked me when I could come back. I told them that it would be much better if they could learn these techniques themselves. This led to many conversations with church leaders, who were able to organize a training in 2011 for pastoral workers serving in some of the fringe parts of the city. At that time, the churches were developing new programs specifically to serve victims of violence. Since then we’ve been invited back to offer several other trainings. 2. What are some of the reasons people seek treatment at Crossroads? What are some common issues? That said, we do offer care for patients who have diagnosed conditions like depression, anxiety, bipolar disorder, and we’ve helped some come off medications or deal with the side effects of the drugs. We’ve helped people get off their blood pressure meds as well as cigarettes. We provide support for people with chronic conditions such as Parkinson’s, kidney failure, Diabetes, and various autoimmune disorders. As our clinic has grown, a large number of people diagnosed with PTSD and/or who have a history of trauma or domestic violence have come in for care. We had one patient from Juarez who had recently been shot in the head, survived, heard of our clinic and having access to our services several times a week over a month we were able to significantly help increase his neurological functioning. Even though it’s a group setting, we treat patients for very sensitive health conditions like menstrual problems as well as prostatitis or even a woman trying to leave an abusive spouse and struggling with trauma and depression. 3. What are some of the biggest problems when it comes to providing accessible healthcare to citizens in low-income communities? Our approach first and foremost has been about making healthcare affordable for everyday people — rich and poor and everyone in between. Healthcare does not have to be expensive to be effective. We have seen this to be true for acupuncture year in, year out. Sustainability is also crucial. Any healthy, accessible system of care has to be sustainable. This is inherently challenging within a humanitarian aid context, when we’re the outsiders coming from a place of privilege and resources, assisting groups that are marginalized and living in poverty. A nun in Juarez told me a story about an outside medical aid group that came in and provided free lab tests and consultations for several months. They also offered some therapies within an impoverished community. People came and got a lot of help from this group. But then the group lost funding and left and now there’s nothing there for these people that the outside workers left behind. There’s very little that has lasted as a result of that project. Another example: We knew of a project in Uganda — MoxAfrica – training health promoters in a Japanese technique called moxa, which has documented astounding outcomes in treating drug-resistant Tuberculosis. We learned from MoxAfrica how we could start something like this in Juarez. A volunteer came to conduct the training, and since then, over the past year and a half, our students have provided thousands of moxa treatments for free. This new tool has increased their skill sets in being able to address some of the common health problems in Mexico for people who lack access to other forms of healthcare. We knew early on that if we — as outsiders — are the ones providing the care then it makes it less sustainable. So we focus on training health promoters already working within low-income communities. The great thing about acupuncture is that it can be very affordable. The cost of acupuncture supplies is extremely cheap when compared to drugs and surgeries and hospitals.The cost of needles for a community acupuncture treatment is less than 50 cents. Moxa: half the cost of needles. How many drugs are that affordable? 4. From a medical perspective, how have citizens in these regions (i.e. Juarez) been affected by the violence? How do the acupuncture treatments help these patients? At a basic level of responding to violence and preventing violence from escalating, we’ve also seen our students’ efforts to be a humble unassuming facilitator peace-building. In a community setting, they create neutral, nonviolent, nonjudgmental, noninvasive, silent and meditative spaces for healing to happen, for people who have been hurt as well as, and sometimes even alongside, and sitting next to, those who have hurt others. Many people may not even recognize trauma as an experience. In fact, it’s not even necessary for the person to have insight into trauma or the nature or cause of their emotional pain in order to benefit from acupuncture. The acupuncture provider doesn’t need to know anything that someone has been through in order to help them. The person doesn’t need to disclose anything or be diagnosed with PTSD or admit they’re a victim. They just have to be willing to sit and rest. Some people — even if they don’t like needles – find a great benefit out of just sitting quietly amidst a group of people receiving acupuncture. These groups hold space for people just to “be” without any cost to them to participate. Everyone needs access to activities like this to rest from society, yet connect with community. Acupuncture — specifically this model of community acupuncture – works well as a mental wellness activity particularly in cultures where western talk therapy and psychoanalysis is rejected, inappropriate or inaccessible. In working with people with trauma, these types of cognitive based therapies can be ineffective, especially for recent events. For someone who has had a recent traumatic experience, one priority is to help them get better sleep. If they don’t sleep for a few straight days after an event, then they may — no matter how healthy they are — start to experience psychosis or lose stability. And one of the first things that many people experience with acupuncture is sleeping better. That’s an important first step in the healing process. We’ve witnessed their volunteer efforts to be a part of alleviating some of the burden of the local healthcare system. 5. Can you tell me about the training and outreach programs Crossroads offers in Juarez? How have the people in this region benefitted from these programs? Molly Molloy is the Border & Latin American Specialist at the New Mexico State University Library. She manages both the website and the Frontera List Google Group.